Well known in her day as a romantic icon, traveller and author, Lesley Blanch died in 2007, aged 103, her fame long since dwindled. Her god daughter Georgia de Chamberet intends to remind us of a remarkable woman. 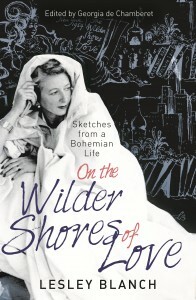 She has brought together a previously unpublished, unfinished memoir, several articles written for British Vogue during World War II, various travel pieces, and a section about Blanch’s husband Romain Gary, a Russian Jew, who became a much decorated Free French war hero, and then a diplomat and prize winning novelist. If the child is mother to the woman, then Lesley Blanch, must have been difficult to live with. ‘I was not a loving child and not at all obliging in daily life,’ she wrote, and she did not make herself sound in the least attractive as she grew up, an only child, in Hammersmith. She attended St Paul’s Girls’ School during the First World War and left in 1921, aged 17, without qualifications or the least idea of what to do next. Having been at St Paul’s myself in the 1950s, I was struck by the similarity between the school life she remembered and my own, for before the revolutionary 1960s, society changed very slowly. Lesley left the Slade in 1924. ‘I had to earn my living double quick.’ She worked at Vogue, where, after only two years, she was appointed Features Editor. She moved on to another publication to become a film reviewer. Her vivid descriptions of living in London throughout the Second World War are full of interesting details. In 1945 she met and married Romain Gary who was to become one of France’s most famous writers but at this time was in London with General de Gaulle. After the war he worked as a diplomat, and Lesley accompanied him on various international postings until, stationed in Hollywood in the late fifties, he left her for the film star Jean Seberg. Lesley Blanch’s first book was published in 1954. The Wilder Shores of Love was an ultra-romantic study of four nineteenth-century women who had escaped the boredom of convention (Lesley’s own lifelong aim) by setting off on solitary journeys of exploration and self-fulfilment. Numerous other books, articles, love affairs and journeys were to follow. Much of the information about Blanch’s life in this edited, posthumous memoir had already appeared in her own account of her early life, Journey into the Mind’s Eye (1968), which, like all her books, sold well and attracted much attention. In her day Blanch was famous and sought-after. Having received this well and lovingly produced compilation just before Christmas, and read it with interest and admiration, I was able to ask several women and a few men, their ages ranging from 19 to 69, what they knew about Lesley Blanch. None of them had ever heard of her.